With the User Path Update wizard, NeoLoad helps you maintain your test scripts quickly and accurately from a release to the next. Updating a User Path enables you to merge the original User Path with a newer recording. It automatically creates a backup copy of the original User Path. at the end of a recording (this is useful when you want to update an existing User Path with the recording you just finished). For more information, see the procedure below. with a right-click on the User Path you want to update with the Advanced > Update with a recent recording command (this is useful when you already have a recording that you want to use to update an existing User Path). For more information, see Context menu. Information: Click here for more information about the User Path Update. 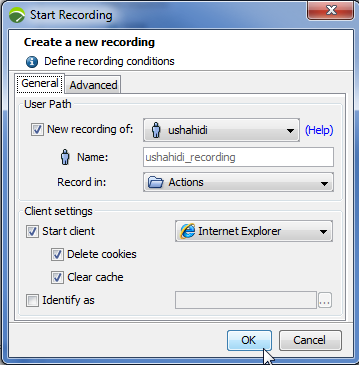 In the Start Recording dialog, check the New recording of option and select the User Path you want to update. In the Record in field, select the Container into which the visited pages are to be recorded. Information: The Transaction editable dropdown list of the Recording bar will be automatically populated with Transactions of the User Path you want to update. Configure the rest of your recording as explained in Create a User Path. The Recording bar is displayed.